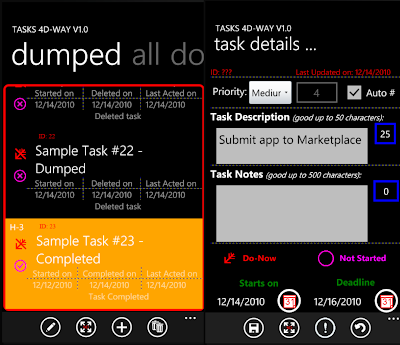 Tasks 4D-Way for windows phone 7 is the most productive way of managing tasks. When you think of or have to act on a task, you can act in one of the 4D ways, namely, Dump it – if it doesn’t deserve your attention at all. If you can’t dump it, then see if you can Delay attending to it. If you can’t delay also, check if it can be Delegated to someone else. If you can’t delegate also, then it’s your job and you better Do it Now. Organize the task into the 4 principal categories. Do-Now tasks that need your immediate attention. Delegated tasks that were assigned to someone else. Delayed tasks that are scheduled for future dates. Dumped tasks that are either not needed or completed. Delayed tasks are brought to Do-Now on scheduled date. Sequence the tasks within High, Medium and Low priorities. Ability to undo changes while adding or editing tasks. Dumped tasks can be deleted permanently. Show / hide details for Do-Now tasks. Indication of how far is the deadline. Up to 500 tasks are allowed to give you good performance. You will have to delete some or all dumped tasks once you reach this limit. Only 25 tasks, in addition to the sample tasks, are allowed. The tasks can’t be deleted permanently.